Consumption of omega-3 fats, such as fish oil, reduce PCOS symptoms and improve your overall health, according to dozens of medical studies. The medical evidence indicates that increased consumption of or supplementation with omega-3 fats can be helpful for these disorders: cardiovascular disease, high blood fats (such as triglycerides), high blood pressure, diabetes, depression, metabolic syndrome, obesity, inflammatory diseases, neurological and neuropsychiatric disorders, and eye diseases. Some women with PCOS may have or will develop several of these disorders. Marine oils are a healthy way to reduce these risks. Fish concentrate oil contains essential fatty acids, or EFAs. They are "essential" because you must have them for life, and your body cannot manufacture them. You must obtain them from your diet. EFAs serve as a highly efficient source of energy and as the primary component of cell membranes and hormones. Deficiencies in EFAs are associated with abnormal development and health problems involving the nervous, cardiovascular, and immune systems. The two most important EFAs in human health are omega-3 and omega-6 fatty acids. The typical American consumes too much omega-6 and not enough omega-3 fatty acids. Fish oil contains high levels of omega 3 fatty acids. "Hello, I just wanted to make a quick comment about fish oil. I have had PCOS since I was sixteen years old. I am now 24. I have struggled greatly with all sorts of symptoms, including a COMPLETE lack of a period for the first two years of diagnosis. I have never taken birth control, as I personally don't like the idea. So, when I was eighteen, I saw a holistic doctor. He put me on fish oil, and the following month I had my period! I have discovered that if I do not take fish oil, I will not have a period, but if I do take it, I will have one. So, if any woman with PCOS out there is doubting the effectiveness of taking fish oil, it is definitely worth trying." Women with PCOS (polycystic ovarian syndrome) have a number of symptoms that can be partially alleviated by omega-3 fatty acids found in fish oil. Medical evidence indicates that fish oil may help with a number of PCOS-related issues, such as: depression, chronic inflammation, heart disease, high blood pressure, high blood fats (triglycerides), diabetes, and stress. Could it also improve your body shape? A new study from the Department of Health Sciences at Gettysburg College indicates this may be the case. The researchers gave one group men and women 4 grams of fish oil daily for six weeks. Another group took 4 grams of safflower oil. Compared to the safflower oil group, the fish oil group gained lean (muscle) mass, and lost significant fat mass. In addition, the fish group tended to have reduced levels of cortisol, which is a stress hormone that contributes to increased fat, especially around the middle. By the way, women who have polycystic ovary syndrome also often have elevated cortisol levels, so fish concentrate oil is something to seriously consider. Based on this new research and dozens of other studies we have on file, it's hard to think of a reason not to be taking this oil daily. 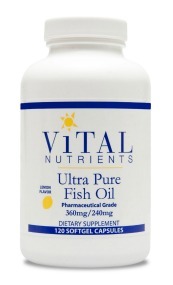 Fish oil concentrate contains two important fat molecules, called EPA and DHA. The University of Tennessee published a study of mice on a high-fat diet. Some were given EPA, some were not. Those mice given the EPA had reductions in their fat weight, and the size of their fat cells shrank. This experiment suggests that humans might also get a similar benefit from fish oil. Equally important, there was less infiltration of white blood cells into their fat tissue. The infiltration of white blood cells is an indication an inflammatory process going on in your fatty tissue. This is not a good thing because chronic inflammation is a powerful cause of your symptoms. Fish oil, and the EPA it contains, is known to suppress inflammation. EPA is highly beneficial to anyone with a problem with fat metabolism. The problem is that many of those who have PCOS are locked into fat-building mode because of the dysfunction of insulin and other hormones. So it just makes good sense to be taking EPA fish oil on a regular basis. Leptin resistance and insulin resistance play an important role in weight loss difficulties and they disturb overall hormonal balance. They are a central cause of PCOS symptoms. Recent animal studies suggest that oil from fish may be helpful in dealing with some of the root causes of polycystic ovarian syndrome. In rats fed a high saturated fat or a high sugar diet, this oil appears to reduce or prevent leptin resistance and insulin resistance. There was a study of 12 overweight men and women who had insulin resistance. They were given DHA (a component of fish oil) for 12 weeks. 70% of the participants showed a decrease in insulin resistance. In rats, insulin resistance was reduced by substituting fish fats for vegetable and animal fats in their diet. 4. Does Fish Oil Improve Your Mind and Mood? And Lift Depression? Fish concentrate oil contains two important omega-3 fats: eicosapentaeoic acid (EPA) and docosahexaenoic acid (DHA). These fats are also the most common ones in your brain. In your brain, these fats perform a multitude of critical functions. A good reason to take fish oil is that it helps to relieve depression, according to the research. Depression is a common symptom of PCOS. Depressed people tend to have lower levels of omega-3 fats. An increasing number of medical studies are suggesting that adequate levels of EPA and DHA fatty acids are necessary for optimal brain function, and possibly for helping to prevent or relieve depression or other forms of psychological distress. For example, researchers at the University of Cincinnati performed a postmortem examination of the brains of 15 people who had "major depressive disorder" as compared to 27 normal people. The brains of the depressed women had a 32% lower level of DHA as compared to non-depressed women. Conversely, the non-depressed women had the highest levels of DHA. A Canadian study of native women showed those with the highest levels of EPA and DHA had a 68% reduction in risk of having psychological distress. (This was not true for the men). A University of Pittsburgh study of middle-aged people showed that those individuals with higher levels of DHA had better nonverbal reasoning, mental flexibility, working memory and vocabulary. Based on these and other research studies, we think supplementation with a marine oil is an important component of your personal health rebuilding program. Their essential fats appear to have life-long health benefits. Also, omega-3 fats are likely to reduce the risk of postpartum depression, manic-depressive psychosis, dementias (Alzheimer's disease and others). Omega-3s are important for preventing cardiovascular disease in women of all ages. Did you know that heart disease is the #1 cause of death of women in the U.S., whether they have PCOS or not? And women with polycystic ovarian syndrome have a significantly increased risk of developing heart disease compared to other women. So anything that will help your heart and circulation is a good thing to do. A healthy diet and daily exercise are obviously basic requirements for a healthy heart. There are also supplements that can be helpful, such as fish oil. Medical research continues to report that the omega-3 fatty acids EPA and DHA result in a lower risk of cardiovascular disease. For example, the Harvard School of Public Health recently released a study showing that women who consumed the highest levels of these fatty acids had at least a 50% reduction in their risk of heart attack, compared to those consuming the lowest amounts. Do you have high blood pressure? Omega 3 oils may help to reduce it. A study at Cornell University has shown that 55% of PCOS women have NAFLD or non-alcoholic fatty liver disease. Fatty liver disease is not restricted to overweight women. In this study, nearly 40% of the women with NAFLD were lean. A growing body of research is showing that marine oils are effective for reversing this disease. A recent study of PCOS women at the University of Western Australia has confirmed the value of fish oil. In this study, 25 women with PCOS were given 4 grams daily of omega-3 fish oils for eight weeks. The women experienced reduced liver fat content, triglycerides and blood pressure. The researchers concluded: "Omega-3 fatty acid supplementation has a beneficial effect on liver fat content and other cardiovascular risk factors in women with PCOS, including those with hepatic steatosis." Women with PCOS have a greater tendency toward inflammation than other women. There is also an association between insulin resistance and inflammation. A primary value of fish oil is that is helps to reduce inflammation. Omega-3 fatty acids are anti-inflammatory whereas some other fatty acids are pro-inflammatory. For example, arachidonic fatty acid is pro-inflammatory. Arachidonic acid dominates the average diet (meat and dairy), and without omega 3 fatty acids, such as fish concentrate oil, this balance tips in favor of inflammation, pain, and blood vessel constriction. I think most of you know by now that a condition called "insulin resistance" is a major cause of PCOS symptoms, whether overweight or not. Insulin resistance is simply an inability to efficiently utilize the insulin hormone. But not everyone is clear about the role that inflammation plays in polycystic ovarian syndrome. It's important because the majority of those with PCOS exhibit chronic inflammation. 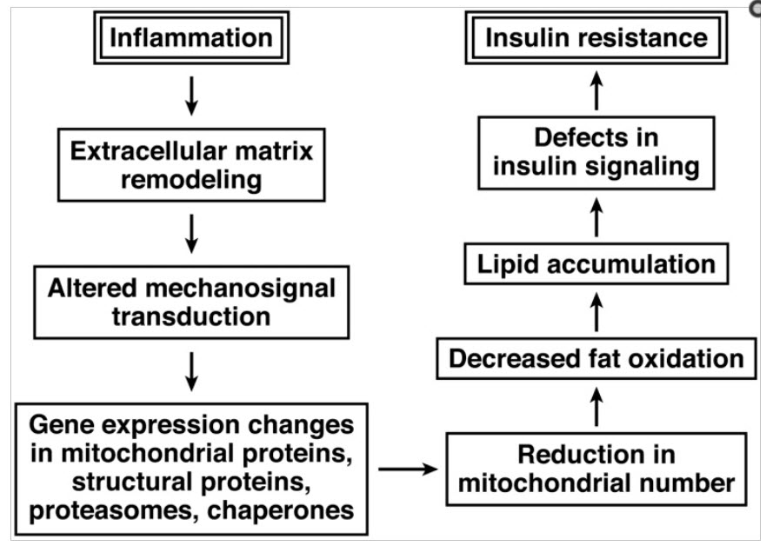 And, as shown in the diagram above from a medical journal, inflammation can make insulin resistance worse. So when you're thinking about supplements for insulin resistance, you also want to also think about their anti-inflammatory possibilities. Take omega-3 oils and vitamin E for example. A study of women with PCOS published last month in the journal of Molecular and Cellular Endocrinology showed these two nutrients in combination for 12 weeks reduced markers of inflammation as well as blood fats. The women also significantly improved their antioxidant capacity. The omega-3 oil used in the study was flaxseed oil. However, fish oil is superior for our purposes because it contains the EPA and DHA anti-inflammatory fatty acids. In contrast, flaxseed oil has to go through metabolic steps inside the body to be converted into EPA and DHA. Only a small fraction of flaxseed is converted, thus it is much less effective compared to fish oil. A good source of natural vitamin E is found in this multi-vitamin/mineral. Melatonin is one of the master hormones in the body. It performs many functions, including supporting ovarian health and egg quality. Unfortunately, many women with polycystic ovary syndrome suffer from disturbed sleep, which impairs melatonin production. According to a recent French study of hamsters, omega-3 fats improve production of melatonin. One group of hamsters was given a diet deficient in omega-3 fats. The other group had a diet adequate in omega-3 fats. The omega-3 deficient hamsters had melatonin production that was 52% lower than the other hamsters. It appears that omega-3 fats favorably affect the pineal gland in the brain, which is the production center for melatonin. Fish EPA-DHA capsules offer a highly concentrated amount of omega-3 fats. It's a good way to get the essential fats you need without having to eat a lot of fish. Excessively high levels of testosterone are linked to most symptoms of polycystic ovarian syndrome. Find out how these oils can help you reduce your testosterone levels. Many women with PCOS have high triglycerides, a blood fat that indicates insulin problems that could lead eventually to diabetes. Fish oil has been shown to consistently lower triglycerides. Omega 3 oils can reduce the risk of diabetes by reducing triglycerides without impairing glucose tolerance. It improves the rate of glycogen storage and enhances insulin secretion from beta cells in the pancreas. Both of these actions improve glucose and insulin control. Chronic stress leads to overproduction of the stress hormone cortisol, which in turn increases insulin resistance. Marine oils blunt the "stress response". Omega-3 fats ensure that a woman's fat tissue contains a reserve of these fats for the developing fetus and the breast-fed newborn infant. Consumption of omega-3s during pregnancy reduces the risk of premature birth and improves intellectual development of a fetus. DHA, one of the omega-3 fats, is especially important for proper development of your unborn child. The presence of large quantities of omega-3 EPA and DHA fats in the diet slightly lengthens pregnancy, and improves its quality. Click here for more information on how fish oil could help your pregnancy. Omega-3 fatty acids could play a positive role in the prevention of menstrual problems and postmenopausal hot flushes. It has been reported that women with PCOS are more likely to have impaired lung function as compared to other women. Fish fats may improve your lung function. The National Research Center for Environment and Health in Germany has reported a correlation between lung capacity and the level of DHA, which is one of the omega-3 fats found in fish. People with the highest DHA levels also had the best lung capacity. The authors of this study concluded: "A high concentration of [DHA] may have a protective effect on lung function. Because this long-chain n-3 polyunsaturated fatty acid is almost exclusively derived from marine oils, fish might have a beneficial effect on lung diseases." Omega-3 fatty acids can help to prevent the development of certain cancers, particularly those of the breast and colon, and possibly of the uterus and the skin. All in all, omega 3 oils from fish are likely to benefit women with PCOS or ovarian cysts. Rahmani E et al. The effects of omega-3 fatty acids and vitamin E co-supplementation on gene expression of lipoprotein(a) and oxidized low-density lipoprotein, lipid profiles and biomarkers of oxidative stress in patients with polycystic ovary syndrome. Mol Cell Endocrinol. 2016 Sep 9. pii: S0303-7207(16)30373-2. LeMieux MJ et al. Eicosapentaenoic acid reduces adipocyte hypertrophy and inflammation in diet-induced obese mice in an adiposity-independent manner. J Nutr. 2015 Mar;145(3):411-7. Bourre JM et al, Dietary omega-3 fatty acids for women, Biomed Pharmacother. 2007 Feb-Apr;61(2-3):105-12. Dyek, DJ, Leptin sensitivity in skeletal muscle is modulated by diet and exercise, Exerc Sport Sci Rev. 2005 Oct;33(4):189-94. Rossi, AS et al, Dietary fish oil positively regulates plasma leptin and adiponectin levels in sucrose-fed, insulin-resistant rats, Am J Physiol Regul Integr Comp Physiol. 2005 Aug;289(2):R486-R494. Lombardo, YB et al, Effects of dietary polyunsaturated n-3 fatty acids on dyslipidemia and insulin resistance in rodents and humans. A review, J Nutr Biochem. 2006 Jan;17(1):1-13. Ghafoorunissa, et al,Dietary (n-3) long chain polyunsaturated fatty acids prevent sucrose-induced insulin resistance in rats, J Nutr. 2005 Nov;135(11):2634-8. Harris WS, Dietary fish oil and blood lipids. Curr Opin Lipidol 1996 Feb;7(1):3-7. Sirtori CR et al, N-3 fatty acids do not lead to an increased diabetic risk in patients with hyperlipidemia and abnormal glucose tolerance. Italian Fish Oil Multicenter Study Am J Clin Nutr 1997 Jun;65(6):1874-81. Storlien LH et al. Influence of dietary fat composition on development of insulin resistance in rats. Relationship to muscle triglyceride and omega-3 fatty acids in muscle phospholipid. Diabetes 1991;40:280-289. Ajiro K et al. Beneficial effects of fish oil on glucose metabolism in spontaneously hypertensive rats. Clin Exp Pharmacol Physiol 2000;27:412-415.